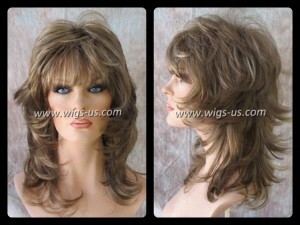 Lets Talk Wigs » Adora Wigs • Human Hair Wigs • Lace Front Wigs • Raquel Welch • Revlon • Synthetic Wigs » Wigs with Highlights! When you need a pop of color and subtle change, highlighted wigs are the way to go. The fibers blend effortlessly like a natural sun-kissed highlight in the summer weather. Salon treatments can be just as beautiful but sometimes damaging from over processing, or just too costly. Wigs with highlights allow you to change your style anytime you choose and protect your own tresses from the chemical processes associated with colors. This style is perfect for naturally slim or oval shaped faces, or those who want to make their faces appear more lean. Brush the layers how you want as some of the curls flip out and some flip under for full coverage and just enough body. This style can be worn by anyone who desires a style that can be easily managed and maintained. Bette Lace Front Wig by Revlon, shown in 4/6R coffee bean is an ebony style wig with more colors towards to ends of the hair and less highlights all around. The lace front is very natural with a seamless ear to ear, high quality lace construction. Bette is made so you can wear it off the face, parted, or how you want. It is also made in several colors to match your complexion easily, giving you confidence. Choose from several colors and this medium length style can transform how you look and feel! Already known internationally as a superior designer for fashionable and trendy wigs, Raquel Welch’s Camera Ready is no exception. Made with Raquel Welch’s signature Sheer Indulgence patented lace technology, the most natural appearance is available to all who don this wig. More than beautiful to the eye, this wig is also comfortable and made to memorize your head shape for a secure fit every time. Shown in R3025S+, highlights are an added feature you will not want to miss out on. Whether you like short or long, curly or straight, Wigs-US has a hairpiece or wig for you that will enhance your wardrobe and improve your confidence. Thousands of styles are only a click away. Next post: Stylish Wig Styles on Sale Now!